Susie Cooper left A. E. Gray & Co. Ltd where she had been a decorator and designer in October 1929 to establish an independent pottery business, first at Tunstall and then at the Chelsea Works, Burslem. In 1931, at Harry Wood’s invitation, Susie Cooper moved her design and decorating studio to the Wood & Sons Ltd Crown Works in Newcastle St, Burslem, where she operating as the ‘Susie Cooper Pottery’. The association with Wood & Sons continued and in 1959 she purchased the Crown Works as the base for her expanding business. From c.1950 Susie Cooper’s new focus was on bone china and the last earthenware pattern (2429) was registered in July 1964. 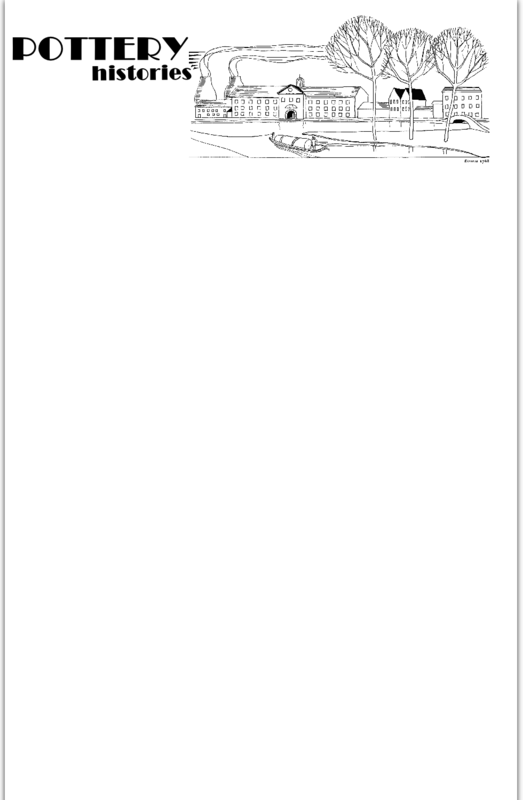 Production of earthenware ceased shortly afterward. The Crown Works remained the base for Susie Cooper’s design studio until the Works were closed by Wedgwood in 1980. The Susie Cooper earthenware produced between the early 1930s and 1964 includes wall masks, figures, art pottery and decorator items, but best known are the collectable tableware decorated using freehand painting, banding, sgraffito, lithography, and aerography. 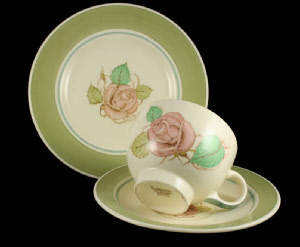 Tableware shapes include the famous Kestrel (introduced in 1932 and still in production in 1964) Curlew (1932), Rex, Falcon (1937), and others. Patterns of the early 1930s echo those developed at Grays – bold floral motifs, banding and geometric designs. 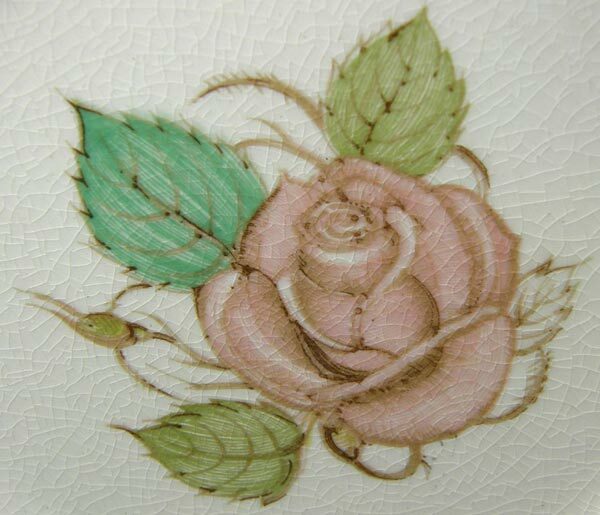 By the mid-1930s the decoration had changed from the vivid geometric to more subtle floral and banded decoration. The multi-colour lithographic patterns ‘Patricia Rose’ and ‘Dresden Spray’ are the best know floral patterns and these were produced, with many variations from the 1930s to the 1960s. In 1987, to celebrate a retrospective exhibition at the Victoria and Albert Museum, Wedgwood re-introduced three Kestrel breakfast sets in re-worked versions of the 1930s patterns Yellow Daisy, Spiral Fern and Polka Dot. Patricia Rose, produced in many variations and colour palettes was perhaps the most recognisable and popular of Susie Cooper’s earthenware patterns. The common Susie Cooper mark found on earthenware is the famous ‘leaping deer’ printed in brown (most commonly), green, pink, blue or black. 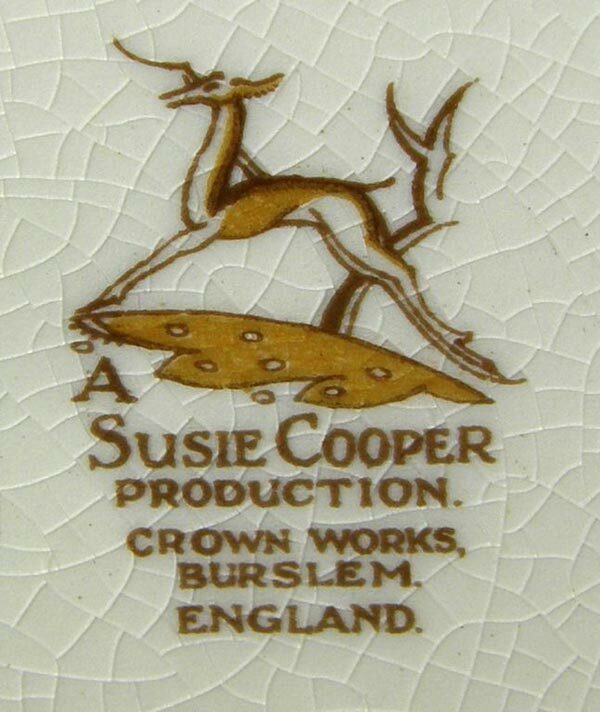 The words ‘A Susie Cooper Production’ and ‘Crown Works, Burslem’ are usually present and many wares include a shape and or pattern number. A number cast into the earthenware body is the year of manufacture.